spinning — Writing… or Typing? Remember when I learned to spin? (Seriously – it’s okay if you don’t.) I have spun lots of fiber since. I have had people try my wheel, I’ve tried different techniques, I’ve skeined and stored yards and yards of handspun. I’ve even given some away. What I hadn’t done yet is knit with any of it. Daft? Yup. That is, until this weekend. John had picked out some roving at Dancing Leaf Farm a while ago, and I had dutifully spun it up. I had even gone so far as to wind it, and it sat amongst my “regular” yarn for about a year. 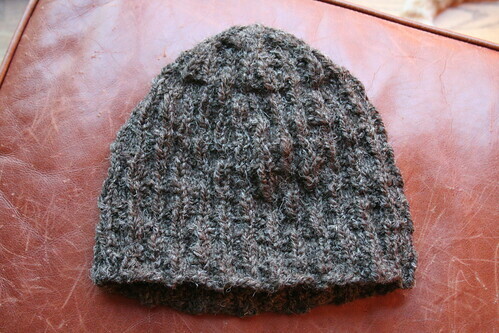 Finally, I found the pattern to knit up – something that would suit my still-pretty-beginner-spinner nobbly yarn. Anne Hanson’s “Paris-Roubaix” hat. It was even a perfect theme – John loves cycling, and I’ve watched many a Spring Classic. This whole project has really made me cultivate “beginner’s mind.” For instance, thank goodness my nobbly handspun pretty well disguises the fact that I really didn’t know what I was doing for the crown decreases. Anyway, here it is. Now we’ll see if John actually wears it… it may need a bath with some conditioner to soften it.